New York, US (BBN)-A four-year-old leukemia patient just had the “best day ever”. 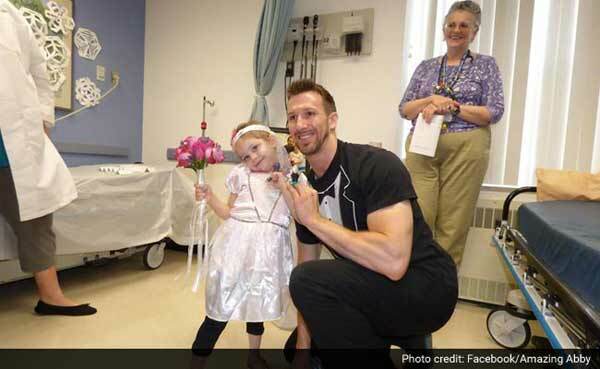 She got to ‘marry’ her favourite nurse at the Melodies Center for Childhood Cancers at Albany Medical Center, repo, reports NDTV. A beautiful video going viral on the Internet shows little Abby, dressed in white, ‘marrying’ Matt Hickling at the hospital. The ‘wedding’ has been viewed over 2.4 million times and been shared over 3.6 lakh times. A couple of weeks ago, Abby told her mother she was getting married. When asked who the lucky boy was, Abby had said Matt, her nurse. “They have always had a great connection since the beginning of her diagnose,” said Abby mom’s on the Amazing Abby Facebook page. Her mother later texted Matt letting him know about this adorable conversation. “‘We’re planning a wedding tomo…’ That was about all the information I got,” she said on Facebook. When informed that he was to be a bridegroom soon, Matt went into planning mode with help from other members of the hospital staff. They put together the ‘wedding ceremony’ in less than 24 hours to surprise Abby. Matt later took to Facebook to post pictures and details about his unique wedding. “Our patient shyly asked me to marry her. I didn’t hesitate to say yes, I got a HUGE hug and we sealed the deal with ring pops being placed on our fingers,” he said on Facebook. “We then took a stroll down the hall in our “Just Married” car (well I pushed) and headed back into the room for cake and photos,” he added. “I know the people at the Melodies Center and know their creativity and thoughtfulness but never expected all of this. Abby’s response… “This is the best day ever!” We are both in awe from today’s visit and smiling ear to ear,” said Abby’s mom on Facebook. This is one ‘wedding’ where we’re happy to be caught sobbing. Thank you Matt, on behalf of Abby.